Delifrance Secret Santa: Sweetest Free-est Treats! E-cards and virtual greetings are all fine and good but can you imagine what it’s like when the virtual crosses over to the real? Hop on over to http://www.mysecretsanta08.com and find out for yourself! Delifrance’s My Secret Santa program takes the classic Kris Kringle celebration, makes it efficient, easy and best of all, FREE! Simply wander over to the Secret Santa website, register and send Secret Santas to your friends. All you need is their name and email address. You can even keep your identity a secret so that guy you’re stalking doesn’t need to know it’s from you, heehee if you’d prefer to surprise your friends and loved ones. What’s special about this Secret Santa is that they can take your note, print it out and redeem it for real life goodies from Delifrance! You’ll get either the Almond Star Cookies or Chocolate Chip Biscotti. 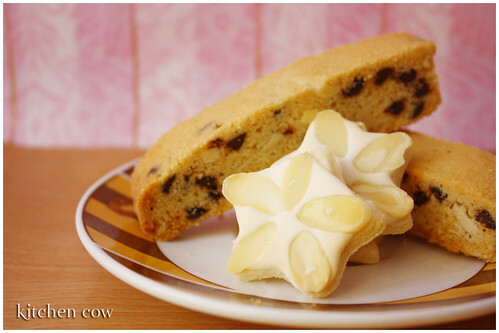 The Almond Star Cookies are little star-shaped cookies that are inspired by classic German Christmas cookies. The little cookies are absolutely yummy. They’re light and buttery, topped with a sweet, meringue-like frosting and almond slivers. The Chocolate Chip Biscotti, on the other hand, is your usual biscotti, studded with chocolate chips and nuts. Definitely the perfect companion for your steaming cup of coffee. Imagine, real life treats for your loved ones, at no cost at all to you. All just a couple of mouse clicks away. Find out more and start sending these sweet treats. Visit the My Secret Santa website now! AIM Conference Center, Glorietta, Insular Life Bldg, RCBC Plaza, SM Makati, Ayala Tower 1, Valero Makati, Zeta Building Legazpi Village Makati, Robinsons Place Manila, U.N. Avenue, Festival Supermall, Alabang Town Center, SM Mall of Asia, The Podium, C5 Libis, St. Luke’s, Greenhills Theater Mall, Roosevelt Greenhills, Philippine Heart Center, Shell SLEX Southbound, Shell SLEX Northbound, Shell NLEX, NAIA – Domestic, NAIA 2 – International, NAIA – Old Domestic, NAIA 3, and International School Manila. This entry was posted in link love, restos & eateries, sponsored events and features. Bookmark the permalink. 5 Responses to Delifrance Secret Santa: Sweetest Free-est Treats! No prob Caryn! Just spreading the luv! Ay sobra, agree ako dun. I only tried it after writing this, otherwise, I would’ve been gushing sa post! It’s sooo…almond-y! Not just because of the nuts but I suspect almond extract too. Perfect with strong coffee since they balance out. The gift giving is extended until December 19!